Yes! 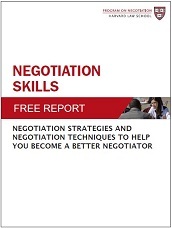 I want my free report Negotiation Skills: Negotiation Strategies and Negotiation Techniques to Help You Become a Better Negotiator. Please provide your email address to download your free report. Along with your FREE report, you will also be registered for Program on Negotiation’s free negotiation posts by email. And remember you can unsubscribe at anytime.